Jason Harris announced this week that CrossPoint is seeking donations to help with the assistance of those caught up in domestic violence situations. The announcement was made on the CrossPoint facebook page and has been met with a good response. 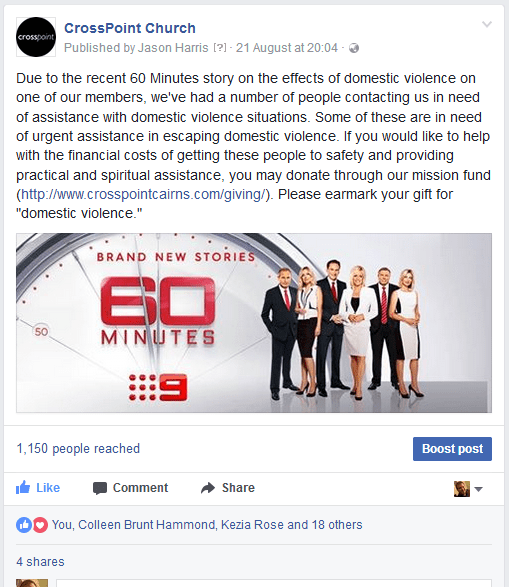 The link for giving is http://www.crosspointcairns.com/giving/. Several have already given toward this appeal and CrossPoint is looking forward to how this fund will allow them to assist those in need of urgent assistance.